Wimpy, the Portland Mercury Kitten? For some reason, the Portland Mercury thinks that the comparatively rare breed of Republican kitten in Multnomah County needs help getting adopted, as opposed to the more common Democratic variety, a typical Leftist failure to understand economic principles. In response to their column . . . Here at the Multnomah County Republican Party, we're terribly concerned about the rising number of homeless Democratic kittens—which is why we're devoting space on our website this week to cats considered unadoptable. WILL YOU OPEN YOUR HEART AND HOME TO ONE OF PORTLAND'S UBIQUITOUS DEMOCRATIC KITTENS? Wimpy is a committed atheist who worships government scientists instead of God, and knows that anyone who questions anything a government scientist says must have something seriously wrong with them. Wimpy firmly believes that only by doing everything that government experts tell us can we avoid an environmental apocalypse. Wimpy loves wrestling with balls of yarn, and giving affectionate "head butts" during cuddle time. Wimpy is terrified that fossil fuel use is about to put Portland deep under water, since he cannot swim, and believes that we need to pay billionaires to make poor quality low carbon fuels that no one wants to keep the polar ice caps from melting. Wimpy is a lazy but loving cat, that you can stretch out over any piece of furniture. Wimpy doesn't believe that there should be any countries, especially America, because we are all just citizens of the world, and we should all live under repressive totalitarian governments that destroy the economy and make everyone suffer equally, except for our glorious leaders. Wimpy enjoys napping in the sunshine, and his gentle snoring sounds like a teeny-tiny race car. Wimpy objects to being classified as a male cat, and believes that gender is just a myth. Wimpy would prefer a household with human residents who have been neutered like him, and thus vote Democratic. Who's that hiding in the pant leg of your jeans? Why, it's Wimpy! Wimpy believes that EBT cards should be used to buy pet food, and looks forward to living in a household that is willing to claim him as an additional dependent so that he can have three or four cans of Fancy Feast every day. Wimpy enjoys licking her tiny little paws and cleaning her tiny little face! TOO... CUTE! To adopt Wimpy, please contact The Portland Mercury at 503-294-0840. 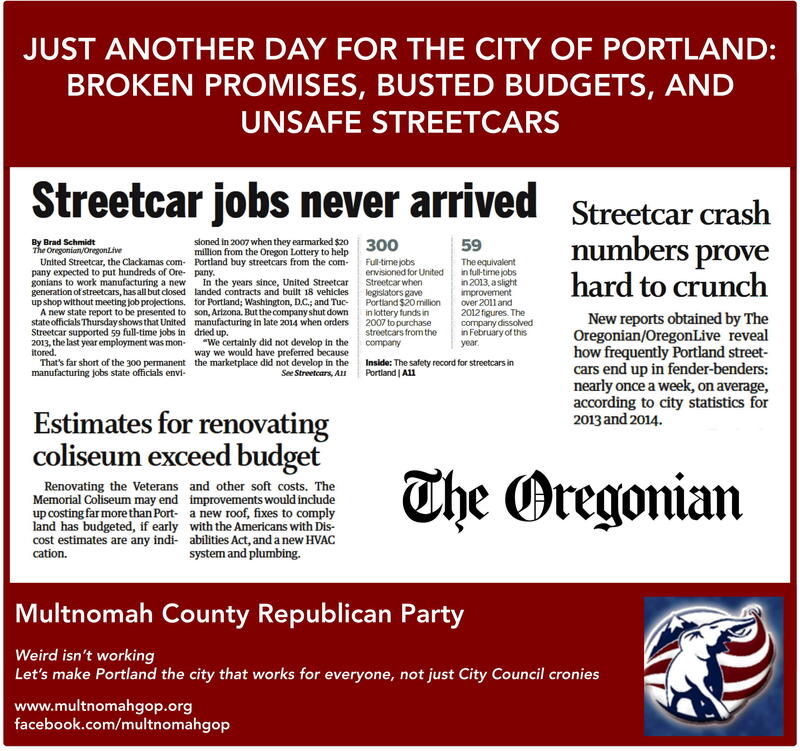 Tell Portland's mayor what you think of his lack of leadership and his out of control spending plans. Portland Mayor (and former Republican) Charlie Hales will be on OPB's Think Out Loud today at noon on 91.5 FM. This is the mayor who couldn't balance his budget, so he tried to force a $43 million tax increase on Portlanders ... without a public vote. Listen in an hit the comments section on OPB's website. Let's give the mayor a lesson in Fiscal Responsibility 101. Today, Oregon Governor John Kitzhaber held an extraordinary press conference. The presser was originally publicized as an opportunity to shed light on the new allegations of wrongdoing by his fiancée Cylvia Hayes. Instead, the governor dodged the most important issues regarding Hayes, her consulting work, and allegations of influence peddling in the governor’s office. Less than 20 minutes into the press conference, Kitzhaber stormed out, leaving many questions unanswered. While Oregonians are left in the dark about relationships between Hayes, her clients, the governor, and his policies, Multnomah County Republicans urge a careful review of legislation promoted by Hayes and her clients. Multnomah County Republican Chair Eric Fruits has a suggestion for the Oregon House and Senate leaders: "Salem should shelve any legislation that has any connection to Cylvia Hayes, her consulting firm, or her clients until the Ethics Commission and FBI investigations are completed. It’s a simple matter of transparency and good government that crosses all party lines. 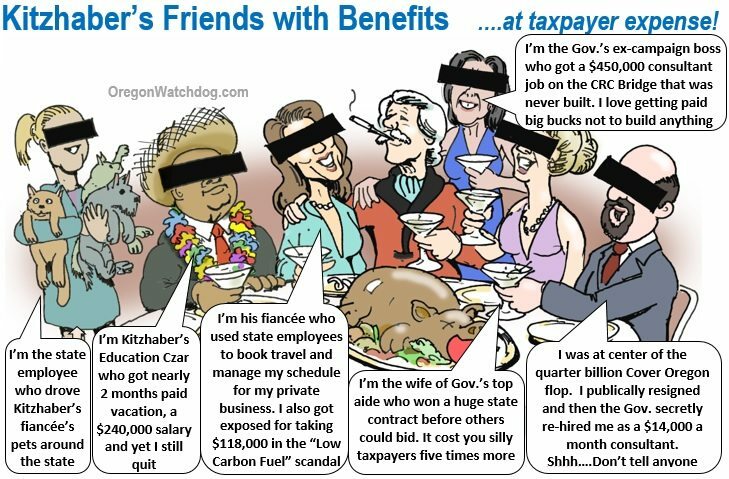 Oregon taxpayers cannot afford to pay for any more special deals tainted by the possibility of corruption." Vice Chair James Buchal was harsher, suggesting that "In any state where all government accountability was not crippled by decades of control by the same criminal gang, indictments would already have been issued." Oregon is one of the least friendly states in the country for small businesses, according to a new ranking released by Small Business Policy Index. The state was ranked as the 6th worst in the nation by the index that weighed issues such as taxes, regulations, government spending and debt. 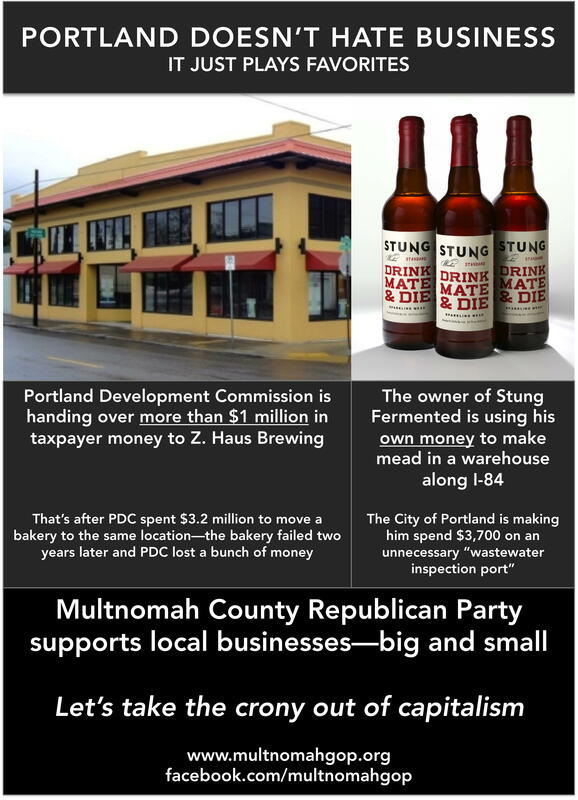 Read the whole thing at GoLocalPDX. Four Portland Public School board seat are up for election in the May 2015 election. Two current members have announced that they will not be seeking re-election, making it a bit easier for some Republicans to shake up PPS. Zone 1 is in Southwest Portland, covering the Wilson High School cluster. Ruth Adkins has announced that she is not running for re-election. Adkins takes credit for hiring Carole Smith, the superintendent who will be best known for her attempts to destroy Portland's neighborhood schools. More recently, Adkins was responsible for overseeing the street fee work group that pushed the hardest for an ultra-progressive income tax to fund the city council's pet projects. Zone 2 is in North Portland and includes Jefferson and Benson High Schools. Current board member, Matt Morton indicated that he will not seek another term. Morton is more famous for conflict of interest allegations, rather than any notable achievements while on the board. While on the PPS board, Morton has served as executive director of the Native American Youth and Family Center, which has contracts with PPS. Now that Adkins and Morton are out and Zone 3 and Zone 7 are on the ballot, Republicans can make a difference at PPS. Candidates for the May 19 election must file by March 19, 2015.